MIDLAND, MICH. – Three Rivers Corporation has earned the Associated Builders and Contractors National Safety Merit Award. The award recognizes Three Rivers for its exemplary safety performance and programs during 2012. This award demonstrates that Three Rivers’ is dedicated to working safe. To qualify for a Safety Merit Award, a company must first demonstrate the highest level of performance – Platinum – in ABC’s Safety Training Evaluation Process (STEP). Prerequisites include an Occupational Safety and Health Administration (OSHA) recordable rate that is below the national average and performance that is clearly “a step above” in 20 key safety program components. 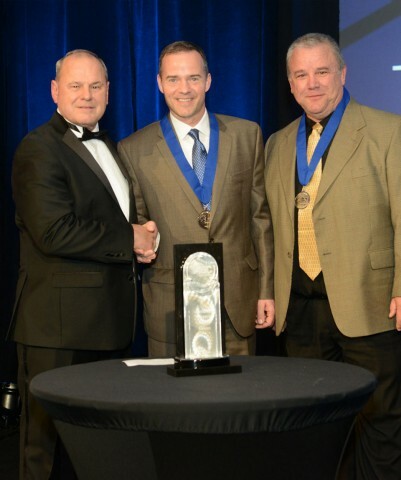 “This is an honor to receive an award like this, we are proud of our work force and their dedication to the highest levels of safety performance.” said Dan Kozakiewicz, Three Rivers’ President. Dan indicates that reduced injuries reduce construction costs, improve employee morale and improve productivity. Three Rivers Corporation representatives Andy Weisbrodt and Paul Crivac received the award during the 23rd annual Excellence in Construction awards celebration at the Marriott Harbor Beach in Ft. Lauderdale, Fla.